Unilever deodorant brand Lynx launched a clothing pop-up store to highlight how young people can be held back by stereotyping and labels. The ‘Unlabelled’ pop-up shop, which opened on 29 August at Protein Studios in Shoreditch for one day only, sold designer and high street T-shirts with all the labels removed to show that beneath these, "we’re all the same". The clothes were accompanied with a new limited gender-neutral Lynx can, which also featured a discarded label. Speaking to Campaign, Rik Strubel, global vice president of Lynx said: "We wanted to create something to bring the idea of 'unlabelled' to life. We looked at the label on our own products and thought about what it means to take these away from products and people." Strubel explained that the experience fits in with Lynx's overall marketing strategy, which focuses on inspiring younger men to 'unleash their magic'. "There are two sides to the coin: we want to help remove stereotyping and also inspire young guys through fun and entertainment to be good role models and to not be afraid of expressing who they want to be," he added. 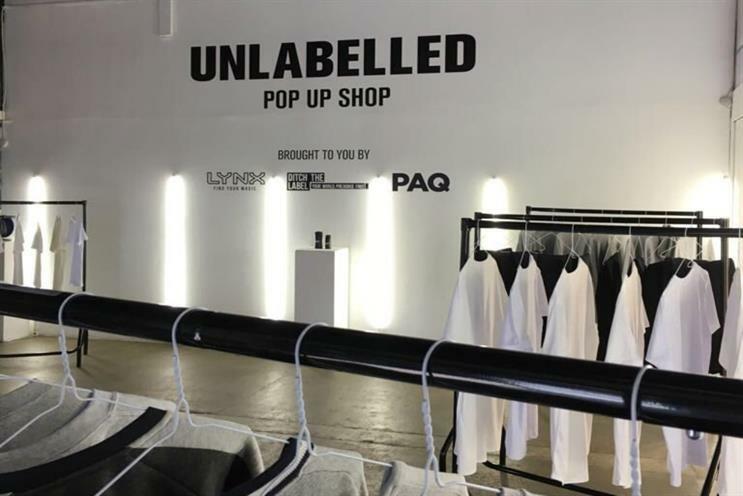 The pop-up, which was targeted at 15-21 year-olds, also raised money for Lynx partner Ditch The Label, a charity that aims to combat bullying among young people aged 12 to 25. Recent research from Ditch The Label and Promundo, another Lynx partner which promotes gender equality, revealed that harmful masculine labels have a direct connection with bullying. Lynx worked with Kyra on the activation.